Here’s a secret about me that is not very well-kept: I love a party! I love to attend them, I love to throw them, I love to plan them. But here’s a secret that not many people know: I don’t spend much time planning them. Slaving away on a party only so I can work the whole time? No thank you! Parties should be as fun for the host as they are for the guests. Set the tone. Before you invite people over, decide what note you want to hit – is this classy and sophisticated, fun and carefree, romantic and relaxing, etc.? Set the mood and ambiance in your home with your goal in mind. Add diffusers and/or candles throughout the home to use aromas to help set ambiance. Think outside the box. Go for something a little unique to be memorable: for example, host a gourmet hot dog dinner party — include specialty toppings, kosher dogs, and bakery buns. Bougie that hot dog up! 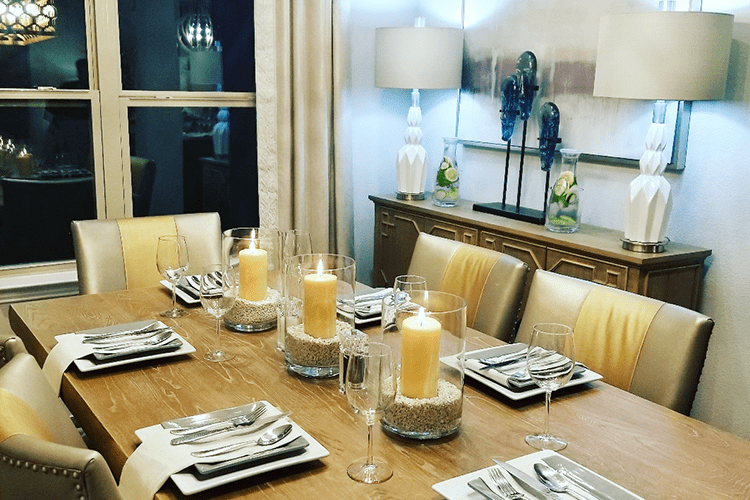 I always throw ridiculous fun dinner parties – from Casino Royale parties with card dealers, to white parties, to chef-driven tasting parties, and more. Pick a theme and commit, commit, commit. Remember that even adults really like to dress up, especially if it’s for a unique reason. But whatever your theme, remember to stick close to it. Spend some time researching décor for your theme. If you start early, it doesn’t have to be a mad dash to figure it out. Make sure the house is clean. Nothing kills the mood more than a mess. Hire an expert to get this done for you. Do not be scrubbing something when guests arrive! Spend time in the bathroom. And not just on your hair! Look for ways to add special touches to bathrooms – special bathroom scents, diffusers, etc. Thoughtful details in a small space when people have a moment to focus really do make a difference. Create an activity where people interact with each other, and not just you. This is my biggest secret to ensuring the whole room has fun. Hire great entertainment, create a fun activity or game, split people into teams, whatever. Give people a way to start conversation with each other so it’s not all on you. Because guess what? There is only one of you! Make sure to enjoy yourself. Make sure to enjoy yourself. For me, that involves hiring out to do the cleaning, cooking and entertaining. Others may enjoy doing all of that themselves, but that’s just not me. Whatever part of entertaining you enjoy, keep for yourself and take time to revel in it. The parts you’re not as crazy about? Hire someone else who is passionate about those things to help make it happen, and help them get creative! You will have a much better time if you are spending time with your guests and not running around trying to refill everyone’s drinks. What are your favorite party-perfect tips? Share one here and you may see it featured in a future blog post. Let me hear it! Next Post Can I Afford to Hire an Interior designer?